2004-07-13 Application filed by 프리스케일 세미컨덕터, 인크. filed Critical 프리스케일 세미컨덕터, 인크. 비휘발성 메모리의 트랜지스터(10)의 전하 저장 위치를 방전시키는 방법은 트랜지스터의 제어 게이트(28) 및 웰 영역(12)에 제1 및 제2 전압들을 각각 인가하는 단계를 포함한다. A method of discharging a charge storage location of a transistor 10 in the non-volatile memory comprises the step of applying each of the first and second voltage to the control gate 28 and the well region 12 of the transistor. 제1 전압은 트랜지스터의 제어 게이트에 인가되며, 제어 게이트의 적어도 일부는 트랜지스터의 선택 게이트(18)에 인접하여 위치된다. A first voltage is applied to the control gate of the transistor, at least a portion of the control gate is located adjacent to the select gate 18 of the transistor. 트랜지스터는 제어 게이트 밑에 위치된 트랜지스터의 구조의 유전물질(22, 26) 내에 배치된 나노클러스터들(24)을 갖는 전하 저장 위치를 포함한다. The transistor includes a charge storage location having nanoclusters to 24 disposed in the dielectric material (22, 26) of the structure of the transistor located below the control gate. 마지막으로, 제2 전압은 제어 게이트 밑에 위치된 웰 영역(12)에 인가된다. Finally, the second voltage is applied to the well region 12 is located under the control gate. 제1 전압 및 제2 전압을 인가하는 단계는 전하 저장 위치의 나노클러스터들로부터 전자들을 방전시키기 위해 구조에 전압차를 발생시킨다. The method comprising: applying a first voltage and the second voltage generates a voltage difference in the structure for discharging electrons from the nanoclusters of the charge storage location. 본 발명은 일반적으로 메모리 디바이스들에 관한 것으로서, 특히 비휘발성 메모리 디바이스들 및 그 제조하는 방법에 관한 것이다. The present invention relates generally to memory devices and, more particularly, to a method for the non-volatile memory devices and their manufacture. 실리콘 나노결정들이 임베딩된 유전체를 갖는 비휘발성 메모리 단일-트랜지스터 비트셀들에는 핫 캐리어 주입(HCI 주입), 역 웰/소스 바이어스(reverse well/source bias)에 의한 HCI 주입, 또는 파울러-노다임(Fowler-Nordheim; FN) 터널링을 사용하여 전자들이 충전될 수 있음을 보여왔다. Non-volatile memory single silicon nanocrystals having the embedded dielectric-transistor-bit cells, the hot carrier injection (HCI injection), reverse well / source bias HCI injected by (reverse well / source bias), or Fowler-no-Dime ( Fowler-Nordheim; using FN) tunneling has been shown that electrons can be filled. 나노결정들은 나노결정들에 대한 상측 또는 하측 유전체를 통해 파울러-노다임 터널링에 의해 방전될 수 있다. Nanocrystals are Fowler through the upper or lower dielectric on the nano-crystal may be discharged by a tunnel furnace dime. 단일-트랜지스터 비트셀들에 대해 FN 터널링 프로그램/소거 또는 HCI 프로그램/FN 소거의 어레이 구조 고려들도 이해된다. For a single-bit cell, the transistor is to be understood also FN tunneling program / erase or HCI array architecture considerations of program / FN erase. 수직 FN 프로그래밍은 매우 낮은 전류 동작이긴 하나, 프로그래밍 시간이 길고(예를 들면, 1-10ms 정도) 비트셀 당 두 개의 트랜지스터들을 구비하거나 비트라인 방향으로 두 개의 병렬 도체들을 구비하는 비효율적인 비트셀을 초래한다. Vertical FN programming is a very low current operation, though inefficient bitcell having one, the programming time is long two parallel conductors with or bit line direction of the two transistors (e.g., approximately 1-10ms) bits per cell results. HCI 프로그래밍은 효율적인 비트셀 및 빠른 프로그래밍(예를 들면, 1-10㎲ 정도)을 달성하지만, 높은 프로그래밍 전류(예를 들면, 100-200μA 정도)가 필요로 된다. HCI programming efficient bitcell and fast programming achieved (for example, 1-10㎲ degree), but the high programming current is in (for example, 100-200μA degree) is necessary. ONO(oxide-nitride-oxide) 저장층과 함께 분할(split)-게이트 비트셀에 소스 측 주입이 핫 정공 소거에 또는 SONOS 디바이스의 얇은 상측 산화물을 통한 소거에 사용할 수 있음을 보여왔다. ONO (oxide-nitride-oxide) split (split) with a storage layer, the gate bitcell source side injection have shown that they can be used to erase through the thin top oxide of a SONOS device, or to the hot hole erase. 그러나, 핫 정공 소거는 산화물 열화가 유발하여 판독 교란(read disturb)이 발생하고, ONO층의 얇은 상측 산화물 소거는 100ms 내지 1초 정도의 소거 시간들 동안에 판독 교란이 발생하기 쉽다. However, the hot hole erase is a read disturb (read disturb) caused by oxide degradation is caused, and an upper thin oxide erase of the ONO layer is likely to read disturbance occurs during the 100ms to about erase time of 1 second. 따라서, 고 신뢰성의 프로그램/소거 동작들 및 낮은 기록 전력를 겸비한 비트셀이 필요하다. 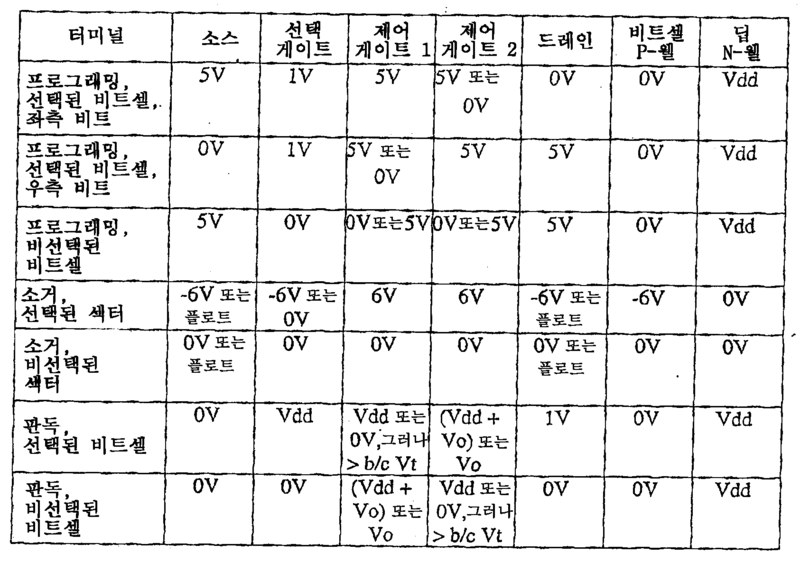 Thus, the bit cell combines high program / erase operation and a low recording reliability jeonryeokreul is required. 본 발명을 예로서 예시하나 동일 구성요소에 동일 참조부호를 사용한 도면으로 한정되지 않는다. As an example of the present invention it is not limited to the drawings with the same reference numerals in the one identical component illustrated. 도 1은 본 개시의 일 실시예에 따른 전하 저장을 위한 유전층 내에 나노클러스터들이 임베딩되어 있는 분할 게이트를 구비한 비휘발성 메모리 디바이스의 단면도. 1 is a cross-sectional view of a nonvolatile memory device having a split gate with nanoclusters have been embedded in the dielectric layer for charge storage according to one embodiment of the present disclosure. 도 2는 본 개시의 또 다른 실시예에 따른 나노클러스터들이 유전층 내에 임베딩되어 있고 또한 폴리실리콘 스페이서들 밑에 배치된 분할 게이트를 구비한 비휘발성 메모리 디바이스의 단면도. Figure 2 is nanoclusters according to an embodiment of the present disclosure are embedded in the dielectric layer and also cross-sectional view of a nonvolatile memory device having a split gate disposed under polysilicon spacers. 도 3은 본 개시의 또 다른 실시예에 따른 비휘발성 메모리 디바이스의 개략도. Figure 3 is a schematic diagram of a nonvolatile memory device according to still another embodiment of the present disclosure. 도 4는 본 개시의 또 다른 실시예에 따른 쉘로우 임플란트를 포함하는 비휘발성 메모리 디바이스의 단면도. 4 is a sectional view of a nonvolatile memory device including a shallow implant according to another embodiment of the present disclosure. 또한, 제1 유전체(22)는 상측 산화물/나노클러스터 표면을 포함하며, F/N 터널링 유전체를 형성한다. Further, the first dielectric 22 includes a top oxide / nanoclusters surface, forms the F / N tunneling dielectric. 제2 유전층(26)은 하측 산화물/나노클러스터 표면을 포함하며 상측 유전체를 형성한다. The second dielectric 26 includes a bottom oxide / nanoclusters surface and forms the upper dielectric. 당업자들은 도면들 내 구성요소들은 간단하게 하고 명료하게 하기 위해 도시된 것이고 반드시 축척에 맞게 도시될 필요는 없음을 안다. Those skilled in the art would know that not necessarily be drawn to scale shown for the components within the drawings are simple and clear. 예를 들면, 도면들 내 구성요소들 중 일부의 크기는 본 발명의 실시예들의 이해를 높일 수 있게 다른 구성요소들에 비해 과장되어 있을 수 있다. For example, the portion sizes of the components within the figures may be exaggerated relative to other elements able to improve understanding of embodiments of the present invention. 도 1은 본 개시의 일 실시예에 따른 전하 저장을 위한 유전층 내에 나노클러스터들이 임베딩되어 있는 분할 게이트를 구비한 비휘발성 메모리 디바이스(10)의 단면도이다. 1 is a cross-sectional view of a nonvolatile memory device 10 having a split gate with nanoclusters embedded within a dielectric layer that is for charge storage according to one embodiment of the present disclosure. 메모리 디바이스(10)는 제1 도전형과는 반대인 제2 도전형의 딥(deep) 웰(14) 위에 위치된 제1 도전형의 비트셀 웰(12)을 구비한 기판을 포함한다. The memory device 10 comprises a substrate having a bitcell well 12 of the first conductivity type located on the deep (deep) well 14 of a second conductivity type opposite to the first conductivity type. 일 실시예에서, 제1 도전형은 p형 도펀트를 포함하고 제2 도전형은 n형 도펀트를 포함한다. In one embodiment, the first conductivity type comprises a p-type dopant and second conductivity type comprises a n-type dopant. 또한, 메모리 디바이스(10)는 선택 게이트 트랜지스터(15)를 포함하며, 선택 게이트 트랜지스터는 게이트 유전체(16) 및 선택 게이트(18)를 포함한다. In addition, the memory device 10 includes a select gate transistor 15, the select gate transistor including gate dielectric 16 and a select gate (18). 메모리 디바이스(10)는 제어 게이트 트랜지스터(21)를 더 포함하며, 제어 게이트 트랜지스터는 적어도 제1 유전층(22), 나노클러스터 층(24), 제2 유전체(26), 및 제어 게이트(28)를 포함한다. Memory device 10 further includes a control gate transistor 21, the control gate transistor has at least a first dielectric layer 22, nanoclusters layer 24, second dielectric 26, and a control gate (28) It includes. 일 실시예에서, 제1 유전체(22), 나노클러스터층(24), 및 제2 유전체(26)로 된 구조는 전하 저장 구조를 형성하며, 나노클러스터들은 전하 저장에 사용된다. In one embodiment, a first dielectric 22, nanoclusters layer 24, and a second dielectric (26) structure to form a charge storage structure, the nanoclusters are used for charge storage. 또한, 제1 유전체(22)는 상측 산화물/나노클러스터 표면을 포함하며, F/N 터널링 유전체를 형성한다. Further, the first dielectric 22 includes a top oxide / nanoclusters surface, forms the F / N tunneling dielectric. 제2 유전체(26)는 하측 산화물/나노클러스터 표면을 포함하며 상측 유전체를 형성한다. The second dielectric 26 includes a bottom oxide / nanoclusters surface and forms the upper dielectric. 일 실시예에서, 나노클러스터들은 실리콘 나노결정들을 포함한다. In one embodiment, the nanoclusters comprise silicon nanocrystals. 선택 게이트 트랜지스터(15)는 협 유전체(20)에 의해 제어 게이트 트랜지스터(21)로부터 분리된다. Select gate transistor 15 is separated from the control gate transistor 21 by a narrow dielectric 20. 협 유전체(20)는 선택 게이트 트랜지스터와 제어 게이트 트랜지스터 간에 200 옹스트롬 미만(<20nm) 정도의 크기를 갖는다. Narrow dielectric 20 has a dimension of less than 200 angstroms (<20nm) approximately between the selection gate transistor and the control gate transistor. 협 유전체(20)는 예를 들면 협 산화물 측벽 유전체를 포함할 수 있다. Narrow dielectric 20 can include, for example, a narrow oxide sidewall dielectric. 메모리 디바이스(10)는 또한 소스/드레인 영역들(30, 32)을 포함한다. The memory device 10 also includes the source / drain regions 30,32. 여기서 논의되는 메모리 디바이스(10)의 여러 층들 및 도핑된 영역들은 당 분야에서 공지된 기술을 사용하여 각각 제조될 수 있다. The various layers and doped regions of the memory device 10 will be discussed may be each prepared using techniques known in the art. 일 실시예에서, 메모리 디바이스(10)는 나노클러스터층이 제1유전층과 제2 유전층 사이에 임베딩된 분할 게이트 디바이스를 포함하며, 여기서 분할 게이트 디바이스는 비휘발성 전하 저장을 위해 이용된다. In one embodiment, the memory device 10 includes a split gate device is embedded between the first dielectric nanoclusters layer and a second dielectric layer, wherein the split gate device is utilized for non-volatile charge storage. 즉, 분할 게이트 디바이스는 하측 유전층과 상측 유전체 사이에 임베딩된 나노클러스터들을 구비한 제어 게이트 트랜지스터, 및 게이트 유전체를 구비한 선택 게이트 트랜지스터를 구비한다. That is, the split gate device is provided with a select gate transistor with a control gate transistor, and a gate dielectric comprising nanoclusters embedded between a lower dielectric layer and upper dielectric. 제1 및 제2 유전체층들은 35-70 Å 정도의 두께를 갖는 유전체들을 포함한다. First and second dielectric layers comprise a dielectric having a thickness on the order of 35-70 Å. 또한, 분할 게이트 디바이스의 트랜지스터들은 소스측 주입이 가능하도록, 협 유전체영역에 의해 분리된다. In addition, the transistors of the split gate device are separated by a narrow dielectric area to enable source side injection. 메모리 디바이스(10)의 1비트 저장 셀에 인가된 바이어스들에 의한 소스측 주입의 예들이 표1 및 표2에 제공된다. Examples of source side injection by the first bit storage cell, the applied bias to the memory device 10 are provided in Table 1 and Table 2. 즉, 표 1은 메모리 디바이스(10)의 1비트 저장 셀의 상측 유전층(26)을 통해 파울러-노다임 터널링에 의해 수행되는 소거 동작을 수행하기 위한 여러 가지 비트셀 동작 전압들을 제공한다. 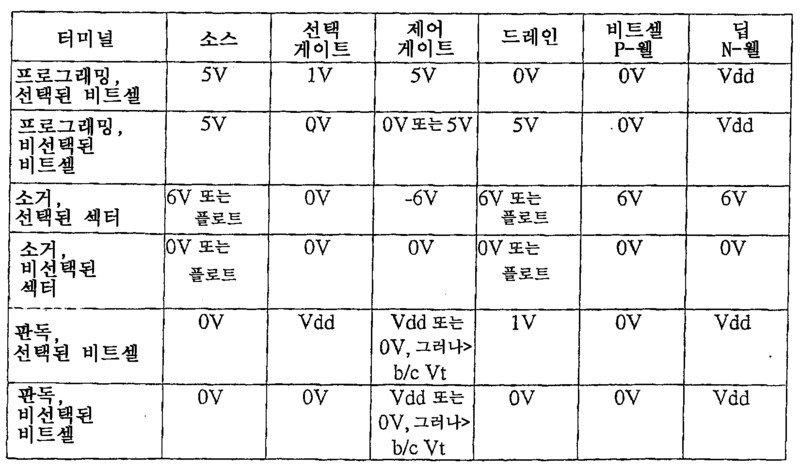 That is, Table 1 shows the Fowler through the upper dielectric layer 26 of the one-bit storage cell of the memory device (10) and provides various bitcell operating voltages for carrying out an erase operation performed by the no-dime tunneling. 또한, 표 2는 메모리 디바이스(10)의 1비트 저장 셀의 하측 유전층(22)을 통해 파울러-노다임 터널링에 의해 수행되는 소거 동작을 수행하기 위한 여러 가지 비트셀 동작 전압들을 제공한다. 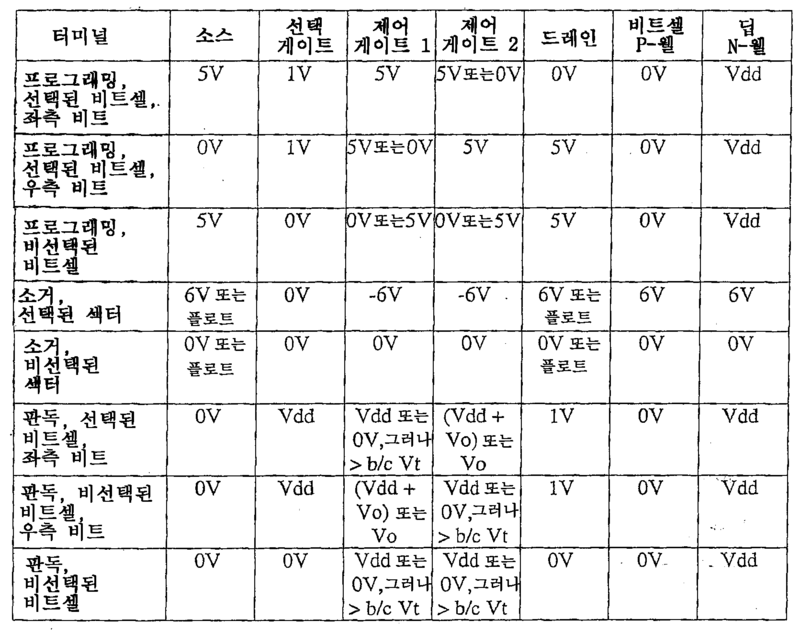 Further, Table 2 shows the Fowler through the lower dielectric layer 22 of the one-bit storage cell of the memory device (10) and provides various bitcell operating voltages for carrying out an erase operation performed by the no-dime tunneling. 판독전류는 기록 전류와는 반대되는 방향으로 흐른다. A read current flows in the opposite direction as the recording current. 도 1의 실시예에서, 비트셀 동작 전압들은 다음과 같다. In the embodiment of Figure 1, the bitcell operating voltages are as follows. 메모리 디바이스(10)의 비트셀 웰(12)은 비트셀 웰 전압, Vpw에서 p형 웰을 포함한다. The bit cell well 12 of memory device 10 includes a p-type well in the bit cell well voltage, Vpw. 선택 게이트(18)는 폴리실리콘 선택 게이트를 포함하며, 여기서 선택 게이트 전압 Vsg이 폴리실리콘 선택 게이트에 인가된다. Select gate 18 includes a polysilicon select gate, wherein the select gate voltage Vsg is applied to the select gate polysilicon. 제어 게이트(28)는 폴리실리콘 제어 게이트를 포함하며, 여기서 제어 게이트 전압 Vcg이 폴리실리콘 제어 게이트에 인가된다. Control gate 28 includes a polysilicon control gate, wherein the control gate voltage Vcg is applied to the polysilicon control gate. 소스 및 드레인 영역들(30, 32)은 각각의 소스/드레인 전압들 Vsource/Vdrain에 있다. Source and drain regions 30 and 32 are the respective source / drain voltage Vsource / Vdrain. 표들에서, Vdd는 양의 전원전압을 나타내며, b/c Vt는 비트셀 임계전압을 나타내며, "플로트(float)"는 전압 또는 접지 어느쪽에도 결합되지 않음을 나타낸다. In the tables, Vdd represents a positive supply voltage, b / c Vt represents the bitcell threshold voltage, represents a "float (float)" is not coupled also to the voltage or any grounding. 도 2는 본 개시의 또 다른 실시예에 따른 나노클러스터들이 유전층 내에 임베딩되어 있고 또한 폴리실리콘 스페이서들 밑에 배치된 분할 게이트를 구비한 비휘발성 메모리 디바이스(40)의 단면도이다. 2 is a cross-sectional view of a nonvolatile memory device 40 having a split gate is disposed below the nanoclusters according to an embodiment of the present disclosure are embedded in the dielectric layer and also the polysilicon spacer. 도 2의 실시예에서, 디바이스(40)에는 폴리 스페이서들에 의해 형성된 제어 게이트들(52)이 형성되어 있다. In the embodiment of Figure 2, device 40 has a control gate 52 is formed is formed by poly spacers. 따라서, 선택 게이트(44)의 양 쪽에 1비트씩, 2비트들이 저장될 수 있다. Thus, it is selected on both sides by one bit of the gate 44, two bits can be stored. 일 실시예에서, 도 2의 디바이스(40)에 대한 기록 동작은 대략 1-10 ㎂ 정도의 낮은 프로그래밍 전류와 대략 1-10㎲정도의 고속 프로그래밍 시간을 갖는다. In one embodiment, also the write operation for the device 40 of Figure 2 has a low programming current and a high-speed programming time of about 1-10㎲ of about 1-10 ㎂. 소거 동작은 낮은 소거 전류 및 대략 10-100ms 정도의 소거시간을 가지고 한 블록의 비트셀에서 동작한다. Erase operation operates on the bit cell of the block having an erase time, the erase current, and a low degree of approximately 10-100ms. 통상적인 비휘발성 메모리 디바이스들에서, 선택 게이트는 대략 50-100 Å 산화물 정도의 얇은 게이트 산화물을 사용하며, 얇은 게이트 산화물은 낮은 전압 트랜지스터 산화물과 유사하다. In conventional non-volatile memory devices, the select gate uses a thin gate oxide of approximately 50-100 Å oxide degree, a thin gate oxide is similar to a low voltage transistor oxide. 그러나, 본 개시의 디바이스(40)에 서, 선택 게이트(44)는 대략 70-90Å 정도의 두께를 가진 고 전압 산화물을 포함한다. However, in the device 40 of the present disclosure, the select gate 44 includes a high voltage oxide with a thickness of about 70-90Å. 이러한 고 전압 산화물은 입력/출력 트랜지스터(I/O) 산화물과 유사하다. Such a high voltage oxide is similar to the input / output transistor (I / O) oxide. 비트셀(12)과 대응 제어 게이트간 소거 전압들을 분할할 수 있게 하기 위해서 비트셀 웰(12)이 +6V 또는 -6V로 바이어스되는 경우, 90Å 두께의 산화물이 필요하다. If the bit cell well 12 is biased at + 6V or -6V to be able to partition the bit cell erase voltage between 12 and the corresponding control gate, there is a need for a 90Å thick oxide. 또 다른 실시예에서, 디바이스(40)는 선택 게이트 트랜지스터(58)를 구비한 나노클러스터 기반의 메모리 디바이스; In yet another embodiment, the device 40 is a nano-cluster-based memory device having a select gate transistor 58; 50-70Å 정도의 두께를 갖는 하측 산화물(46)과, 20-25% 표면 피복도(coverage) 정도의 나노클러스터층(48)과, 대략 50Å 정도의 두께를 갖는 고온 산화물(HTO)의 상측 산화물(50)로 구성된 박막 저장 스택; An upper oxide of the lower oxide 46, and 20-25% surface pibokdo (coverage) degree nanoclusters layer 48 and a high temperature oxide (HTO) having a thickness of about 50Å of a thickness of about 50-70Å ( 50) a thin film storage stack consisting of; 및 박막 저장(TFS) 스택 위의, 선택 게이트(44)의 양측 상의 측벽 스페이서 제어 게이트들(52)을 포함한다. And a thin film storage (TFS) stack including the above, the selection control on the both sides of the sidewall spacers of the gate 44 the gate 52. 상측 산화물(50)은 HTO가 증착된 산화물이기 때문에, HTO를 포함하고, 저온 산화물(예를 들면, TEOS)내의 많은 수의 전자 또는 정공에 비해, 상기 증착된 산화물 내 전자 또는 정공 트랩 사이트들의 수를 최소화한다. Since the upper oxide 50 is an HTO deposition oxide, including the HTO, and low temperature oxide can be of a large number of electrons or holes, the deposited oxides within the electron or hole traps than the sites in the (e.g., TEOS) to be minimized. 따라서, 박막 저장 스택은 각각의 게이트 전극(52) 밑에 배치된 영역 내에 상측 산화물(50), 나노클러스터들(48), 및 하측 산화물(46)을 포함한다. Accordingly, the thin film storage stack includes top oxide 50, the nanoclusters 48, and bottom oxide 46 in a region disposed below each gate electrode 52. 또한, 메모리 디바이스(40)는 소스측 주입 프로그래밍 및 상측 산화물(50)을 통한 파울러-노다임 터널링 소거를 위해 구성된다. In addition, the memory device 40 through the source-side injection programming and Fowler top oxide (50) is configured for no-dime tunneling erase. 여기에서 논의되는 바와 같은, 메모리 디바이스(40)의 각종의 층들 및 도핑된 영역들은 당 분야에 공지된 기술을 이용하여 각각 제조될 수 있다. As discussed herein, the various layers and doped regions of the memory device 40 may be each prepared using techniques known in the art. 메모리 디바이스(40)의 2비트 저장 셀에 인가된 바이어스들에 의한 소스측 주입의 예들이 표3 및 표4에 제공된다. Examples of source side injection by the second bit storage cell, the applied bias to the memory device 40 are provided in Tables 3 and 4. 즉, 표3은 메모리 디바이스(40)의 2비트 저장 셀의 상측 유전체(50)를 통해 파울러-노다임 터널링에 의해 수행되는 소거 동작을 수행하기 위한 여러 가지 비트셀 동작 전압들을 제공한다. 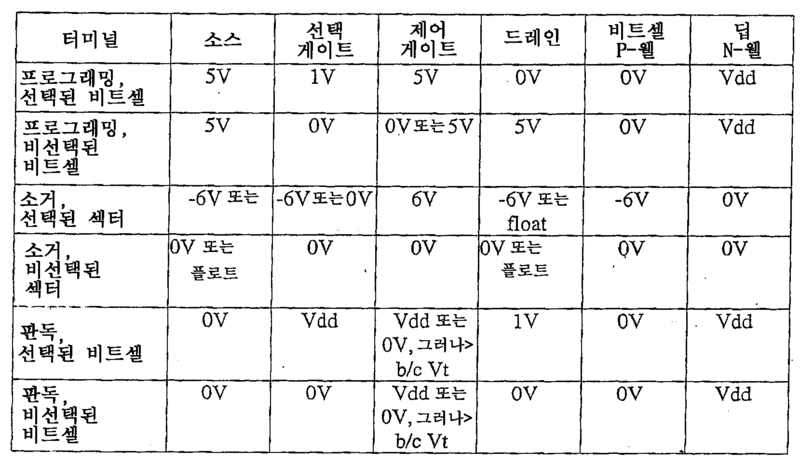 That is, Table 3 shows the Fowler through the dielectric 50, an upper 2-bit storage cell of memory device 40 - provides various bitcell operating voltages for carrying out an erase operation performed by the no-dime tunneling. 또한, 표4는 메모리 디바이스(40)의 2비트 저장 셀의 하측 유전체(46)를 통해 파울러-노다임 터널링에 의해 수행되는 소거 동작을 수행하기 위한 여러 가지 비트셀 동작 전압들을 제공한다. In addition, Table 4 shows the Fowler through the lower dielectric 46 of the 2-bit storage cell of memory device 40 - provides various bitcell operating voltages for carrying out an erase operation performed by the no-dime tunneling. 판독 전류는 기록 전류에 반대되는 방향으로 흐른다. The read current flows in the direction opposite to the write current. 도 2의 실시예에서, 비트셀 동작 전압들은 다음과 같다. In the embodiment 2, the bitcell operating voltages are as follows. 메모리 디바이스(10)의 비트셀 웰(12)은 비트셀 웰 전압 Vpw에서의 p형 웰을 포함한다. The bit cell well 12 of memory device 10 includes a p-type well in the bit cell well voltage Vpw. 선택 게이트(44)는 폴리실리콘 선택 게이트를 포함하고, 여기서 선택 게이트 전압 Vsg이 폴리실리콘 선택 게이트에 인가된다. Select gate 44 includes a polysilicon select gate, wherein the select gate voltage Vsg is applied to the select gate polysilicon. 제어 게이트들(52)은 폴리실리콘 제어 게이트들을 포함하고, 이에 제1 및 제2 제어 게이트 전압 Vcg1, Vcg2가 폴리실리콘 제어 게이트에 인가된다. The control gates (52) comprises a polysilicon control gate, whereby the first and second gate control voltages Vcg1, Vcg2 is applied to the polysilicon control gate. 소스 및 드레인 영역들(30, 32)은 각각의 소스/드레인 전압들 Vsource/Vdrain에 있다. Source and drain regions 30 and 32 are the respective source / drain voltage Vsource / Vdrain. 표들에서, Vdd는 양의 전원전압을 나타내며, b/c Vt는 비트셀 임계전압을 나타내며, Vo는 나노결정들이 하나 이상이 전자들로 충전되는 프로그램된 임계전압을 나타내며, "플로트(float)"는 전압에도 접지에도 결합되지 않음을 나타낸다. In the tables, Vdd represents a positive supply voltage, b / c Vt represents the bitcell threshold voltage, Vo represents the threshold voltage of nanocrystals program at least one is filled with electrons, "float (float)" represents an even voltage is not coupled to ground. 도 3은 본 개시의 또 다른 실시예에 따른 비휘발성 메모리 디바이스(70)의 개략도이다. Figure 3 is a schematic diagram of a nonvolatile memory device 70 according to another embodiment of the present disclosure. 메모리 디바이스(70)는 예를 들면 참조부호 72, 74, 76, 78로 표시한, 여기 개시된 각종 실시예들에 따른 비트 셀들을 포함하여, 로우들 및 칼럼들로 배열된 비트 셀 어레이를 포함한다. The memory device 70, including in some cases as reference numerals 72, 74, 76, a, including bit cells according to the one, where various embodiments disclosed represented by 78, arranged in rows and columns bit cell array . 메모리 디바이스(70)는 로우 디코더(80), 칼럼 디코더(82), 센스 증폭기들(84), 및 로우 디코더(80)와 칼럼 디코더(82)를 제어하기 위한 제어회로(88)를 더 포함한다. The memory device 70 further comprises a control circuit 88 for controlling row decoder 80, column decoder 82, sense amplifiers 84 and row decoder 80 and column decoder 82, . 로우 디코더(80)는 어드레스 입력(90)을 통해 어드레스 정보를 수신한다. The row decoder 80 receives address information via address input 90. The 칼럼 디코더(82)는 어드레스 입력(92)을 통해 어드레스 정보를 수신한다. Column decoder 82 receives address information via address input 92. The 센스 증폭기들은 칼럼 디코더(82)로부터 신호 정보를 수신하고, 증폭된 정보 또는 데이터를 데이터 출력(94)에 출력한다. Sense amplifiers receive signal information from column decoder 82, and outputs the amplified information or data to the data output (94). 로우 디코더(80)는 어드레스 입력(90)에 수신된 어드레스 정보를 디코딩하여 적합한 워드라인들(96, 98)에 정보를 출력한다. The row decoder 80 outputs information to decoding the address information received on address input 90, the appropriate word line (96, 98). 칼럼 디코더(82)는 어드레스 입력(92)에 수신된 어드레스 정보를 디코딩하며, 정보를 비트라인들(100, 102, 104)을 통해 수신한다. Column decoder 82 decodes address information received on address input 92 and receives information via bit lines (100, 102, 104). 일 실시예에서, 비트셀(72)은 선택 게이트 트랜지스터(112)와, 게이트 트랜지스터(112)의 대향 양측에 배치된 측벽 트랜지스터들(114, 116)을 구비한 메모리 디바이스를 포함한다. In one embodiment, the bit cell 72 includes a memory device with a transistor in a side wall disposed at opposite sides of the select gate transistors 112 and gate transistors 112, 114 and 116. 측벽 트랜지스터들(114, 116)은 각각 유전체 나노클러스터 박막 저장 메모리 스택들(118, 120)을 포함한다. Sidewalls transistor (114, 116) comprises the dielectric thin film nano-cluster storage memory stacks 118 and 120, respectively. 유전체 나노클러스터 박막 저장 메모리 스택들(118, 120)은 도 1, 도 2, 또는 도 4의 것들과 유사한 스택들을 포함한다. And the dielectric thin film nano-cluster storage memory stacks 118 and 120 comprise what is similar to the stack of Figure 1, Figure 2, or Figure 4. 비트셀(72)은 각각, 대응하는 비트라인들(102, 104)에 결합된 소스/드레인 영역들(122, 124)를 더 포함한다. Bit cell 72 further includes source / drain regions (122, 124) coupled to the bit lines 102 and 104, respectively, correspond. 또한, 비트셀(72)은 참조부호 126으로 표시한, 전압전위 V WELL 에 결합된 딥 웰 영역을 포함한다. In addition, the bit and cell 72 includes a deep well region coupled to a one, the voltage potential V WELL by the reference numeral 126. 몇몇의 실시예들에서, 메모리 어레이의 로우(row)에 위치된 메모리 셀들(72, 74, 76, 78)의 트랜지스터들의 전하 저장 위치들을 방전시키는 방법은 제1 워드라인(108, 106)에 제1 전압을 인가하는 단계를 포함한다. In some embodiments, the method of discharging the charge storage locations of transistors of the row (row) of memory cells (72, 74, 76, 78) located in the memory array is a first in first word line (108, 106) and a step of applying a first voltage. 메모리 어레이의 로우에 위치된 메모리 셀들(72, 74, 76, 78)은 트랜지스터의 제어 게이트와 기판(12) 사이에 위치된 유전물질 내에 배치된 나노클러스터들(118, 120)을 포함하는 전하 저장 위치를 갖는 트랜지스터(114)를 포함한다(도 1 및 도 2). The memory cells located in the row of the memory array (72, 74, 76, 78) is a charge storage comprising the nano cluster (118, 120) disposed in the dielectric material located between the transistor control gate and the substrate 12, and a transistor 114 having a position (Figs. 1 and 2). 각각의 메모리 셀(72, 74, 76, 78)의 트랜지스터의 제어 게이트는 제1 워드라인(108)에 결합되고 기판(12) 상에 위치된다. The control gates of the transistors of the memory cells (72, 74, 76, 78) is coupled to a first word line 108 is positioned on the substrate 12. 각각의 메모리 셀(72, 74, 76, 78)의 트랜지스터의 제어 게이트의 적어도 일부는 트랜지스터의 선택 게이트(112)에 인접하여 위치되고 유전물질은 제어 게이트와 선택 게이트 사이에 위치된다. Each memory cell at least a portion of the control gate of the transistor (72, 74, 76, 78) is located adjacent to the selection gate 112 of the transistor dielectric material is located between the control gate and the select gate. 제2 전압(126)이 기판(12)의 웰 영역(14)에 인가된다. The second voltage 126 is applied to the well region 14 of the substrate 12. 각각의 메모리 셀(72, 74, 76, 78)의 트랜지스터에 대해서, 제1 전압을 인가하는 단계와 제2 전압을 인가하는 단계는 전하 저장 위치의 나노클러스터들(118)로부터 전자들을 방전시키기 위해서 유전물질 내에 배치된 전하 저장 위치의 나노클러스터들(118)을 갖는 유전물질 양단에 전압차를 발생시킨다. The method comprising applying a phase and a second voltage for applying a first voltage to the transistor of each memory cell (72, 74, 76, 78) in order to discharge electrons from the nanoclusters (118) of the electrical charge storage location to generate a voltage difference across the dielectric material having the nanoclusters (118) of the charge storage location disposed in the dielectric material. 또 다른 실시예들에서, 메모리 셀들(72, 74, 76, 78)의 트랜지스터들의 전하 저장 위치를 방전시키는 방법은 제1 전압을 제1 워드라인(110)에 인가함과 동시에 제2 워드라인(110)에 제3 전압을 인가하는 단계를 포함하고, 제2 워드라인(110)은 메모리 셀들(72, 74, 76, 78)의 트랜지스터들의 전자 저장 위치들을 방전시키는 각각의 메모리 셀(72, 74, 76, 78)의 트랜지스터의 선택 게이트(112)에 결합된다. In yet other embodiments, the memory cells (72, 74, 76, 78) a method of discharging a charge storage location of the transistor is applied, and at the same time a second word line to a first voltage on a first word line 110 of the ( 110) in each memory cell that includes applying a third voltage, the second discharge electrons storage locations of transistors of the word line 110. the memory cells (72, 74, 76, 78, 72, 74 , 76, 78) is coupled to the select gate 112 of the transistor. 제3 전압은 대략적으로 제2 전압 내지 0V 사이의 범위에 있다. The third voltage is approximately in a range between the second voltage to 0V. 또 다른 실시예들에서, 메모리 셀들(72, 74, 76, 78)의 트랜지스터들의 전하 저장 위치들을 방전시키는 방법에서, 각각의 메모리 셀(72, 74, 76, 78)의 트랜지스터는 제어 게이트(116)로부터 선택 게이트(112)의 대향 측 상에 위치된 제2 제어 게이트(116)를 더 포함한다. In still other embodiments, the transistors of the memory cells (72, 74, 76, 78), each memory cell (72, 74, 76, 78) in the process of discharging the charge storage locations of transistors of the control gate (116 ) and selection gate (further includes a second control gate (116) located on the opposite side of 112) from. 각각의 메모리 셀(72, 74, 76, 78)의 트랜지스터는 트랜지스터의 제2 제어 게이트(116)와 기판(12) 사이에 위치된 유전물질 내에 배치된 나노클러스터들(120)을 포함하는 제2 전하 저장 위치를 더 포함하고, 제2 제어 게이트(116)와 선택 게이트(112) 사이에 위치된 유전물질을 포함한다. Second to the transistor of each memory cell (72, 74, 76, 78) comprises a nano-clusters (120) disposed in the dielectric material located between the second control gate 116 and substrate 12 of transistor further comprising a charge storage location, and comprises a first dielectric material located between the control gate 116 and the select gate 112. the 각각의 메모리 셀(72, 74, 76, 78)의 트랜지스터의 제2 제어 게이트(116)는 제2 워드라인(106)에 결합된다. Each memory cell (72, 74, 76, 78) and the second control gate 116 of the transistor is coupled to a second word line 106. 각각의 메모리 셀(72, 74, 76, 78)의 트랜지스터의 제2 전하 저장 위치에 저장된 전하를 방전시키는 단계는, 제2 워드라인(106)에 제3 전압을 인가하는 단계, 및 기판(12)의 웰 영역에 제4 전압(126)을 인가하는 단계를 포함한다. Applying a third voltage to each memory cell (72, 74, 76, 78) a step of discharging the first charge stored in the second charge storage location of the transistor of the second word line 106, and a substrate (12 ) and the well region includes the step of applying a fourth voltage (126). 각각의 메모리 셀(72, 74, 76, 78)의 트랜지스터에 대해서, 제3 전압을 인가하는 단계 및 제4 전압을 인가하는 단계는 유전물질 내에 배치된 제2 전하 저장 위치의 나노클러스터들(120)을 갖는 유전물질의 양단에 전압차를 발생시킨다. Each of the memory cell comprising: applying a first phase and a fourth voltage applied to the third voltage for a transistor (72, 74, 76, 78) has a first nanoclusters of the second charge storage location disposed in the dielectric material (120 ) to generate a voltage difference at both ends of the dielectric material having a. 도 4는 본 개시의 또 다른 실시예에 따른 쉘로우 임플란트들(132, 134)을 포함하는 비휘발성 메모리 디바이스(130)의 단면도이다. 4 is a cross-sectional view of a nonvolatile memory device 130 that includes the shallow implant according to another embodiment of the present disclosure 132,134. 제어 게이트 트랜지스터들(54, 56)의 스페이서 디바이스의 전하-중립 제어 게이트 임계전압에 대해 어떠한 가정도 하지 않았다. It did not make any assumptions about the neutral control gate threshold voltage - of the control gate transistor (54, 56) a charge of the spacer device. 선택 게이트 형성(44) 후에 수행되는 쉘로우 안티몬 또는 비소 주입 임플란들(132, 134)를 사용하여, 각각의 스페이서 디바이스의 임계전압 Vt는 제로 볼트(0V) 미만이 될 수 있고, 그럼으로써 판독동작동안 제어 게이트들에 바이어스를 가할 필요성이 완화된다. Using the shallow antimony or arsenic implant implant (132, 134) is performed after select gate formation (44), the threshold voltage Vt of a respective spacer device can be below zero volts (0V), the read operation and thereby the need to apply a bias to the control gate is relaxed while. 즉, 메모리 디바이스(40)는 비소(As) 또는 안티몬(Sb)의 자기정렬 카운터 도핑된 임플란트들을 사용하여 각각의 스페이서 디바이스 밑에 선택적으로 낮은 채널 도핑으로 제조된다. That is, the memory device 40 is made of a selectively lower channel doping under a respective spacer device using self-aligned counter doped implants of arsenic (As) or antimony (Sb). As 및 Sb의 카운터 도펀트들은 이들이 후속 가공단계들에서 실질적으로 확산되지 않는 능력에 기인해서 선택된다. Counter dopants of As and Sb are selected due to the capability to which they do not substantially diffuse in subsequent processing steps. 또한, 스페이서 디바이스들은 대략 200-1000 Å 정도의 채널 영역을 갖는다. In addition, the spacer devices have a channel region of about 200-1000 Å. 즉 단(short) 채널 디바이스이다. In other words only (short) is a channel device. 따라서, 스페이서 디바이스들의 임계전압은 단 채널 스페이서 디바이스들의 성능특성들의 열화없이 낮아진다. Thus, the threshold voltage of the spacer devices is lowered without degradation of performance characteristics of the short channel spacer devices. 본 발명이 특정 도전형 또는 전위들의 극성에 관하여 기술되었으나, 당업자들은 도전형들 및 전위들의 극성들은 역으로 할 수 있음을 알 것이다. While the invention has been described with respect to specific conductivity types or polarity of potentials, skilled in the art the polarity of the conductivity type and the potential will recognize that it is possible to reverse. 전술한 명세에서, 본 발명은 구체적인 실시예들에 관하여 기술되었다. In the foregoing specification, the invention has been described with respect to specific embodiments. 그러나, 당업자는 이하 청구항들에 개시된 본 발명의 범위 내에서 다양한 수정들 및 변경들이 행해질 수 있음을 알 것이다. However, those skilled in the art will appreciate that various modifications and changes may be made within the scope of the invention set forth in the following claims. 따라서, 명세 및 도면들은 한정하기보다는 예시로 간주되어야 할 것이며 모든 이러한 수정들은 본 발명의 범위 내에 포함되도록 의도된다. Accordingly, the specification and figures will be regarded in an illustrative rather than limiting and all such modifications are intended to be included within the scope of the invention. 이익들, 그 외 이점들, 및 문제들에 대한 해결책들이 구체적인 실시예들에 관하여 위에 기술되었다. Benefits, other solutions to the advantages and problems have been described above with regard to specific embodiments. 그러나, 이익들, 이점들, 문제들에 대한 해결책들, 및 어떤 이익, 이점, 또는 해결책이 일어나게 하는 또는 더욱 두드러지게 하는 어떤 요소(들)은 청구항들 중 어느 하나 또는 전 청구항들의 결정적, 필요, 또는 필수의 특징 또는 구성요소로서 해석되지 않는다. However, the benefits, advantages, problems in the solution of, and any benefit, advantage, or any element (s) to be two or more pronounced that happen solution is critical and needs of any one or all of the claims claim for, or not to be construed as a feature or element required. 여기서 사용되는, "포함하다"라는 용어는 나열된 구성요소들을 포함하는 공정, 방법, 물품 또는 장치가 이들 구성요소들을 포함할 뿐만 아니라 명시적으로 나열되지 않은 또는 이러한 공정, 방법, 물품, 또는 장치에 본연의 다른 구성요소들도 포함하게, 비배타적 포함을 포괄한다. Here, the term "comprise" used in the process, method, article, or apparatus that not only comprise those components that are not explicitly listed, or such a process, method, article, or apparatus that comprises the components listed in to contain the other components of the original, intended to cover a non-exclusive included. 상기 제어 게이트 밑에 위치된 웰 영역(well region)에 제2 전압을 인가하는 단계로서, 상기 제1 전압을 인가하는 단계 및 상기 제2 전압을 인가하는 단계는 상기 전하 저장 위치의 상기 나노클러스터들로부터 전자들을 방전시키기 위해 상기 구조의 양단에 전압차를 발생시키는, 상기 제 2 전압을 인가하는 단계를 포함하는, 트랜지스터의 전하 저장 위치 방전 방법. The method comprising: applying a second voltage to a well region (well region) located under the control gate, applying a phase and the second voltage applied to the first voltage from the nanoclusters of the charge storage location a charge storage location of a transistor including a discharge method, the method comprising: applying the second voltage to generate a voltage difference at both ends of the structure for discharging electrons. 제1항에 있어서, 상기 트랜지스터는 상기 제어 게이트와 상기 선택 게이트 사이에 위치된 유전물질 및 상기 제어 게이트와 상기 선택 게이트 사이에 위치된 상기 유전물질내에 배치된 나노클러스터들을 포함하는, 트랜지스터의 전하 저장 위치 방전 방법. The method of claim 1, wherein the transistor has a charge storage of the transistors including nanoclusters disposed in dielectric material located between the control gate and the selected dielectric material located between the gate and the control gate and the select gate location discharge method. 제1항에 있어서, 상기 제1 전압을 상기 제어 게이트에 인가함과 동시에 상기 선택 게이트에 제3 전압을 인가하는 단계로서, 상기 제3 전압은 상기 제2 전압 내지 0V 사이의 범위에 있는, 상기 제3 전압을 인가하는 단계를 더 포함하는, 트랜지스터의 전하 저장 위치 방전 방법. According to claim 1, comprising the steps of: applying a third voltage to the first voltage to the control gate is applied, and at the same time the select gate to the third voltage within a range between said second voltage to 0V, the the charge storage location of a transistor-discharge method further comprising the step of applying the third voltage. 상기 제3 전압을 인가하는 단계와 상기 제4 전압을 인가하는 단계는 상기 제2 전하 저장 위치의 상기 나노클러스터들로부터 전자들을 방전시키기 위해 상기 제2 구조의 양단에 전압차를 발생시키는, 트랜지스터의 전하 저장 위치 방전 방법. Applying a fourth voltage and applying a third voltage to generate a voltage difference between both terminals of the second structure for discharging electrons from the nanoclusters of the second charge storage location of a transistor discharging a charge storage location method. 상기 제1 전류 단자 영역과 상기 제2 전류 단자 영역 사이에 위치된 상기 기판내의 채널 영역을 포함하는 트랜지스터를 포함하고, 상기 제어 게이트는 상기 채널 영역의 적어도 제1 부분 상에 위치되고 상기 선택 게이트는 상기 채널 영역의 적어도 제2 부분 상에 위치되는, 메모리 어레이. The first current terminal region and the second comprises a transistor comprising a channel region in the substrate located between the current terminal region, wherein the control gate is located over at least a first portion of the channel region of the select gate the memory array of claim at least located on the second portion of the channel region. 상기 제2 제어 게이트와 상기 선택 게이트 사이에 위치된 유전물질을 더 포함하고, 상기 제2 제어 게이트는 상기 채널 영역의 적어도 제3 부분 상에 위치된, 메모리 어레이. Said second control gate and said selection further comprising a dielectric material located between the gate and the second control gate, the memory array positioned on the at least a third portion of the channel region. 제5항에 있어서, 상기 복수의 메모리 셀들의 각각의 메모리 셀의 상기 트랜지스터는, 상기 제어 게이트와 상기 선택 게이트 사이에 위치된 상기 유전물질내에 배치된 나노클러스터들을 더 포함하는, 메모리 어레이. The method of claim 5, wherein the transistor of each memory cell of the plurality, the memory array further comprises: nanoclusters disposed in the dielectric material located between the control gate and the select gate. 상기 기판의 웰 영역에 제2 전압을 인가하는 단계로서, 상기 복수의 메모리 셀들의 각각의 메모리 셀의 상기 트랜지스터에 대해서, 상기 제1 전압을 인가하는 단계와 상기 제2 전압을 인가하는 단계는 상기 전하 저장 위치의 나노클러스터들로부터 전자들을 방전시키기 위해서 상기 유전물질내에 배치된 상기 전하 저장 위치의 나노클러스터들을 갖는 상기 유전물질 양단에 전압차를 발생시키는, 상기 제2 전압을 인가하는 단계를 포함하는, 트랜지스터들의 전하 저장 위치 방전 방법. Applying a second voltage to said transistor, comprising the steps of: applying a first voltage of the substrate, each memory cell comprising the steps of applying a second voltage to the well region, of the plurality of memory cells of the said in order to discharge electrons from the nanoclusters of the charge storage location for generating a voltage difference across the dielectric material having the nanoclusters of the charge storage location disposed in the dielectric material, comprising the step of applying the second voltage a charge storage location of a transistor-discharge method. 제8항에 있어서, 상기 제1 전압을 상기 제1 워드라인에 인가함과 동시에 제2 워드라인에 제3 전압을 인가하는 단계를 더 포함하고, 상기 제2 워드라인은 상기 복수의 메모리 셀들의 각각의 메모리 셀의 상기 트랜지스터의 상기 선택 게이트에 결합되고, 상기 제3 전압은 상기 제2 전압 내지 0V 사이의 범위에 있는, 트랜지스터들의 전하 저장 위치 방전 방법. According to claim 8, of the first word line is applied, and at the same time 2 further comprising the step of applying a third voltage to the word line and the second word line of the plurality of memory cells to the first voltage coupled to the select gate of the transistor of each memory cell, it said third voltage, a charge storage location of a transistor-discharge method in the range from the second voltage to 0V. 상기 복수의 메모리 셀들의 각각의 메모리 셀의 상기 트랜지스터에 대해서, 상기 제3 전압을 인가하는 단계 및 상기 제4 전압을 인가하는 단계는 상기 제2 전하 저장 위치의 상기 나노클러스터들로부터 전자들을 방전시키기 위해 상기 유전물질내에 배치된 상기 제2 전하 저장위치의 나노클러스터들을 갖는 상기 유전물질의 양단에 전압차를 발생시키는, 트랜지스터들의 전하 저장 위치 방전 방법. With respect to the transistor of each memory cell of the plurality, the method comprising: applying the steps and the fourth voltage applied to the third voltage is discharging electrons from the nanoclusters of the second charge storage location the second charge, the charge storage locations of transistors discharge method which generates a voltage difference at both ends of the dielectric material having the nanoclusters of storage locations disposed in the dielectric material in order.